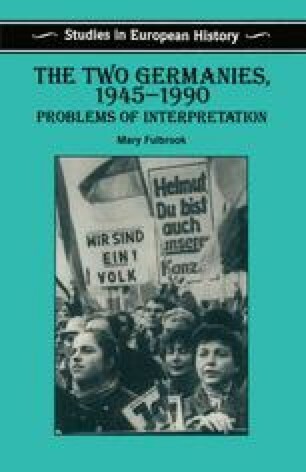 How can the histories of the two Germanies best be characterised? Periodisation is simply a convenient framework for the retrospective imposition of intellectual order on the flow of events and trends. Sometimes turning points are obvious: there are key dates which stand out as denoting major turning points, beginnings or ends. But historians are often concerned with identifying and explaining longer trends of continuity or more gradual processes of change. And historians working in different theoretical traditions will tend to impose rather different categories on whatever they select and define as discrete historical periods. Historical categorisation can moreover be used for political ends to attempt to create certain perceptions of reality in the minds of the public. And it is often only with the benefit of hindsight that certain developments or events stand out as important.